IN THE STEAMY New York cultural hothouse, even starchitects fear to tread when it comes to erecting a new building for a venerated museum. In the mid-1980s, Michael Graves’s design to expand the Whitney Museum of American Art on Madison Avenue destabilized the institution with controversy: his overwhelming Post Modernist proposal — heavy on columns and plinths, massive and arrogant — literally piled on the existing Modernist icon by Marcel Breuer, provoking a torrent of acrimony from architects, and hostility from townhouse neighbors objecting to a colossus next door. The bruising public disapproval and the project’s ultimate failure clipped the wings of Graves’s then high-flying career, which immediately lost altitude and never quite recovered. Still short of space for a collection that had long since outgrown the Breuer building, the Whitney again turned its attention to the problem after the plucky Adam Weinberg became director in 2003. 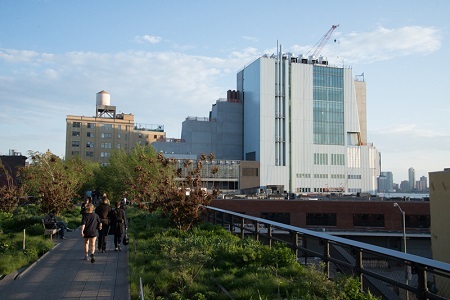 He hired Italian architect Renzo Piano to study expanding the Whitney onto an adjacent site on Madison Avenue. The exploration revealed that the permissible gallery floor plates would be too small to justify the effort. 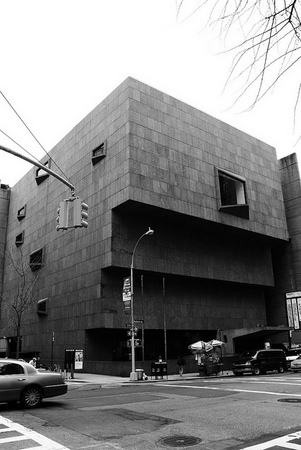 The Whitney then had to think the unthinkable: giving up the beloved Breuer building to search for its future elsewhere in Manhattan. Now, after four years of construction, and a final hurrah at the old Whitney last year with the much-debated Jeff Koons retrospective, the new Whitney just opened in the downtown Meatpacking District to a design by Piano, veteran of a dozen museums in the US (including two at the Los Angeles County Museum of Art). Piano collaborated with executive architects from the New York firm Cooper, Robertson & Partners. The first show, America Is Hard to See, inaugurated the new museum on May Day, and even the Empire State Building got into the act, celebrating the event with a light show featuring colors inspired by paintings in the collection. The Breuer Whitney — a powerful and dense block of a building, with cantilevered floors hovering serenely over their own shadows — is a hard precedent to follow. Cloaked in dark gray granite, the Breuer stands back from Madison Avenue behind a moat of air, floating in a saturnine world of its own, keeping its own company, a Greta Garbo that wants to be alone. Wisely, Piano didn’t even try to emulate the icon. Rather than transporting Breuer’s ideas downtown, he shifted paradigms, designing up from the neighborhood’s character and the museum’s requirements rather than fitting the program into a simple form or single concept. More worldly and engaged, Piano’s Whitney acknowledges the surrounding environment, a willing participant in the push and pull of buildings high and low, ugly and beautiful. From Gansevoort Street, the main artery through the heart of the Meatpacking District, you hardly notice that the new eight-story, 220,000-square-foot, $422 million Whitney is there, since its stepped terraces, jungle-gym steel staircases, and chunky volumes merge visually into the surrounding jumble of mismatched factories, water towers, fire escapes, and the adjacent High Line — an old elevated railbed repurposed as an urban promenade. Piano picked up on the industrial imagery of a blue-collar district that developed adjacent to the city’s wharves in the 19th and early 20th centuries. Piano’s design doesn’t import the uptown imagery of gentrification but takes on, like a chameleon, the coloring of the downtown district. Piano’s interpretation of Modernism, rooted in the industrial vernacular, returns home here to its historic origins. It’s a natural. The museum not only looks like the city around it — it behaves like a small city. Piano layers different activities vertically, in a Dagwood sandwich that piles functions — from restaurant, café, and bookshop on the ground floor, to an auditorium and offices above, and then to a stack of galleries, and finally to a congratulatory café that works like a summit camp for museum mountaineers on the highest terrace. Front to back, he layers the width of the building, from galleries to circulation core, to curatorial offices and conservation labs. He connects it all with efficient interior corridors but most of all with irresistible staircases inside and out that link the terraced building like a steep hillside town on the Amalfi Coast. He has urbanized the building first by unpacking the standard box, dispersing activities on all floors, and connecting it all with staircases that form a vertical High Line. Like a handful of major museums, including Frank Lloyd Wright’s Guggenheim and Frank Gehry’s Guggenheim, the design defines the institution: Piano’s Whitney is open, accessible, energized, urban, fun. For all its architectural icons, Manhattan is not a collection of monuments but a dense urban collage in which tight street grids pack buildings into an urban aggregate, exciting for its juxtapositions of scale, texture, materials, profile, histories, and periods. As in a Joseph Cornell box, the urban juxtapositions establish relationships between the parts — one of the reasons that a stroll on the High Line turns the city into a cinematic loop of evolving views, buildings seen against buildings, foregrounds against backgrounds. New York always seems to be able to absorb another building in its asparagus patch because the collage is dynamic, never complete, and surprisingly tolerant. You’re in the thick of it on the High Line and in the Meatpacking District. With the sensitivity of a Geiger counter, or perhaps just because he’s Italian and attuned to historic cities, Piano responded to the collage, and in a design unique to New York and even to his long career in America, he internalized within the building the complexities ringing the site. A generation or two ago, architects defended their buildings against the toxins of the city by building fortresses, as did Breuer in the uptown Whitney, but here, Piano, without forcing the design, thickens the viscous street life of Manhattan by designing a building that acts as a catalyst sustaining and precipitating urban activity. It opens to the city and takes it inside. The commission was urban from the outset: no need to plant apologetic trees to make nice. Weinberg and the Whitney went shopping for a site at a time when the city, under the leadership of the influential planner Amanda Burden in the urban-friendly Bloomberg administration, was searching for a cultural institution to be built at the southern end of the High Line, just where the old elevated terminates. Burden didn’t want an office building, but a public institution whose openness would complement the popular High Line. A museum would anchor it, encouraging pedestrian traffic along the promenade: the energy of each would feed the other. The site was set in the midst of a dense, motley streetscape of no particular distinction, a parcel that only an urbanist nerd could love. All arch and no keystone, the mostly low-scale brick buildings of the neighborhood needed the right piece of architecture to hold it together. The corner site, a block long, pivoted the loosely knit neighborhood from the city to the adjacent Hudson River at a plaza, which is also where pedestrians can take a steel staircase to and from the High Line. The site was a transitional node negotiating the local urban compass, a place where the High Line and Gansevoort could pass the urban baton to a receptive building to carry the neighborhood west to the river. Piano — tall, thin, elegant, wispy hair graying — is remarkably Type B, disarmingly warm, unpretentious, and relaxed in a field that does not encourage those characteristics. He brings that character into his building — an easy quality, a sense of balance and generosity. When he talks about the interior pressures of a program on the skin of a building, he puts his two fists inside his pale green Shetland sweater and punches out to show how, in the case of the Whitney, the facade had to take the punches given by the museum program from the inside. In his office opposite the site, the 77-year-old architect, soft-spoken but animated and enthusiastic, enumerates all the considerations converging on the site. Instead of terracing the building toward the river to the west to capture the river view, he terraced the eight-story structure in the opposite direction — toward the city — like a ziggurat, allowing the sun to reach the High Line, the plaza at the corner, and the surrounding low-rise streets and buildings. There are accidental valleys in Manhattan, with low buildings bordered by higher structures, and the terraces ease the new Whitney into the Meatpacking valley in Chelsea at its western edge, allowing room for the area to breathe. Indeed the sunlight pours right down the terraces of the Whitney through Piano’s office windows, proving his point. “The idea was to break down the mass with terraces, to look at and talk to the city, to flirt with it,” he says. “It was not just for the pleasure of making terraces.” The cliff-like front facade facing the Hudson follows West Street, a high-speed boulevard that angles off the grid, turning the site into a trapezoid. Like Eskimos with snow, Italians differentiate many types of piazzas. Piano looked at the streetscape and realized that he could broaden Gansevoort — if he glazed the entire ground floor of the museum, programing the space as a lobby, event space, and restaurant with terrace, he could effectively widen the street into the type of piazza that Italians call a largo (a long, narrow piazza). Surrounding the entire ground floor with glass, he brought the street into the building and the museum into the street in a reciprocal visual relationship, unlike the standoff between the museum and street at the uptown Whitney. Entry into the lobby is free, and so passersby can drop in, browse the books, head into the café, and lunch on the terrace overlooking Gansevoort. It’s all friendly and accessible, neither aloof nor defensive. The street life continues behind glass as the museum starts. Piano’s largo was just the beginning of unexpected reciprocities. Opening sight lines from the end of the High Line toward the Hudson, he sloped the ceiling of the lobby down and chamfered the corner of the building, so that anyone standing on the High Line could see past the building and through the lobby to the Hudson. Conversely, anyone in the lobby could look back at the city, at the origin of a cone of vision opening up toward the Meatpacking District. Likewise, pedestrians walking past the angled glass lobby wall find themselves in a visual funnel that shoots their gaze toward the river, as though the building were an optical instrument allowing visitors to see the city and the river stereometrically. The diagonal sight lines also dynamize the building and the site. On its lower levels, it’s a building of hypotenuses. Ironically, Breuer had also designed his building as an optical instrument, placing bug-eyed, trapezoidal windows in the facades, which, like Cubist monocles, torque views of the surrounding city when seen from the inside. Piano coincidentally carries over that optical tradition, using the building as a lens. The difference is that the Breuer museum is landlocked in the uptown urban grid, and the windows, even though askew, look out onto solid apartment blocks that thwart long views. Piano’s optical funnels wedge open the urban block, unlocking the city, leading it to the river, the sky, and the sunset. The architectural design mediates between the city and the distant landscape. The view recalls the famous Steinberg cartoon of America seen from Manhattan. This is one of the very few buildings in insular Manhattan that opens the island to what Piano, as an Italian hailing from a long, skinny peninsula, calls with some awe, “the immensity of the West.” The museum is, after all, the Whitney Museum of American Art, and the architecture makes good on the name, implying, too, that a museum that has long had a Manhattan and New York orientation is now opening itself through its body language to the rest of the country. The collection need not be New York–centric. The architecture establishes a less chauvinistic attitude, and helps redefine and broaden the institution. Usually museums are conceived as closed treasure chests, but by responding to the potential of the site, Piano opened a closed building type, making the first steps at extroverting the usual introversion. The departure from precedent was quietly radical, but radical nonetheless, especially at this large institutional scale, even though the understated Piano does not claim to have built a manifesto. When Piano punched his sweater from the inside, he was explaining that the largest gallery escaped the envelope of the building: “It sticks out, doesn’t stay inside,” he says. At 18,000 square feet, the fifth-floor gallery, New York’s largest column-free exhibition space, doesn’t conform to the opaque, leaning volume above that envelops the smaller galleries on the upper floors. Piano differentiates main programmatic parts of the building by articulating them with distinctly different forms. Hans Hofmann, a pioneer of early abstract American art whose work is in the collection, pushed and pulled space on his canvases by manipulating blocks of color. Piano literally pushed and pulled forms in space — his seismographic design registers forces and requirements in reaction to the demands and opportunities of the site and program. Pure geometric solids from Plato’s playbook or an overriding, totalizing concept would corset the forces and functions that Piano handles with an open, flexible syntax. His geometries are opportunistic: like his sweater, the envelope of the museum is elastic, giving with the forces, changing in section all the way up. 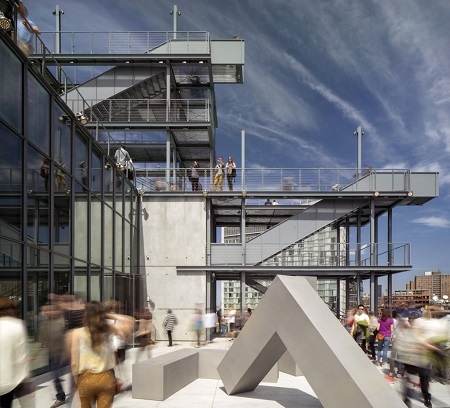 His terraces and exterior staircases, like the High Line, are populated with people who are real-time occupants moving through the building, literally humanizing it — the living equivalent of marble figures sculpted in a classical frieze or tympanum. People occupy a facade meant to be used rather than just seen. From opening day, these steel scaffolds climbing through thin air have been crowded, something of a promenade or boardwalk — like the High Line below, only vertical. Visitors circulating between floors outside the building, as though on the decks of an ocean liner, are treating themselves to some of the views that painters captured on canvases now on the museum walls. 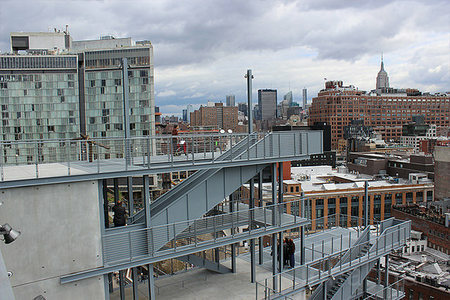 The steel staircases also resonate with the surrounding water towers and fire escapes. In 1971, the young Piano burst onto the international architectural scene when, as a self-confessed “bad boy,” he and fellow architect Richard Rogers won the competition for the Centre Pompidou, an oil refinery of a building in the middle of historic Paris. 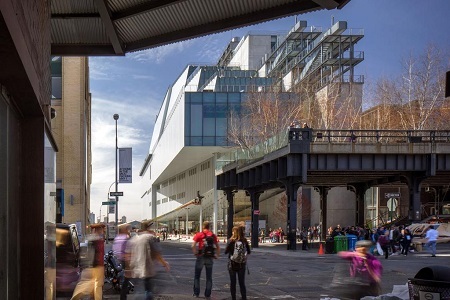 Its facade is a steel exoskeleton supporting escalators and catwalks, and at the Whitney, Piano echoes the exoskeleton by joining three stories of terraces with exposed steel structures projecting from the body of the museum like the gantries that once occupied the docks across the street. At the Centre Pompidou, the urbanization happens on a flat facade, while at the Whitney it happens episodically throughout the building in 3-D, at grade, up the facade, and even within the building, where the elevators and a wide, generous steel staircase are the first things visitors see entering the front door. The terrace views of the surrounding urban diorama brilliantly explain Piano’s collage of volumes, voids, and steel scaffolds. The largo in the lobby, the view corridors funneling through the building, the ziggurat terraces, and the staircases — all nest very naturally in this context, of which they are part and parcel. The city grew organically over the decades; Piano responded organically, creating an asymmetrical, indeterminate shape that delivers experience more than form. If the exterior is quietly active, catching the pitches thrown by the city, the push and pull of the exterior has little effect on the open-plan galleries. Far from being a tense battleground between art and architecture, the interior is quiet and deferential: there are no curving walls, heroic spaces, precious materials, or overwhelming dimensions to usurp the place of art. The galleries are straightforward and unpretentious, high-ceilinged, generously sized, well proportioned, with freestanding partitions, and easy to navigate. The four stories of galleries occupy floors above the lobby, three of them behind an inclined wall paneled in steel. Each of the column-free galleries varies in size, the smallest being on the top floor under saw-toothed skylights that recall factory buildings. All are long and narrow relative to their length, so that none have the bleed of a big field of space: the narrow widths keep the spaces snug, disciplined, and intimate. To the north of the galleries, Piano organized a top-to-bottom service spine traversing the building west to east, from the river to the city, which houses the elevators, the grand steel staircase, curatorial offices, and conservation labs, all contained in a long, tall prismatic bar distinct from the galleries. From the High Line, the bar may now look like Yosemite’s West Face, but the museum has first right of refusal on the adjacent site for further growth, and in all probability, the cliff will eventually be absorbed in the inevitable expansion. Like a double-sided fireplace, the service core will then serve the galleries to the south, and any new galleries to the north. Breuer brought the brooding temperament of his building inside with dark slate floors and coffered concrete ceilings, but Piano’s interior has a lighter temperament, starting with reclaimed Southern yellow pine floors that have been left unvarnished. 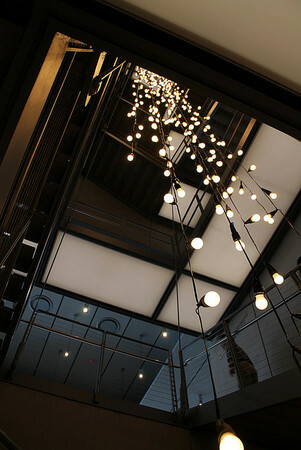 The down lights ignite a pale glow, warming the space. The distressed wide-plank floors spare the galleries the clinical coolness of the white cube. America Is Hard to See showcases the collection, which was initially formed by Gertrude Vanderbilt Whitney, a sculptor who started collecting the works of her contemporaries in the 1920s and ’30s. A mini-show in a first-floor boutique gallery is devoted to this blue-blooded, blue-stockinged spirit, along with some of the works she collected (especially strong on Edward Hopper). 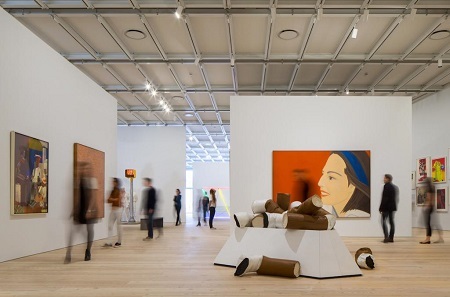 But the entire show, with many historic paintings and sculptures (on the terrace), barely puts the galleries through their paces, since they have been designed to handle the explosions of form that have arrived on the art scene and in the Whitney biennales over the last two generations. An unobtrusive modular ceiling grid, equipped with lights, electrical conduits, and data feeds, is structurally sound enough for suspending art works, giving the curators great flexibility. Curators can hang works from the steel grid of light tracks, or tap into its electronic wiring for data. They can also nail into the low-tech pine floor. The galleries are not precious, but practical and versatile. The modular steel panels wrapping the block of galleries and the ceiling grid are the only hints that Piano remains a systems architect who normally designs with modules in a rationalist Cartesian grid. In this museum, the universality of systems design that structured the Centre Pompidou has given way to local decisions, which keep his systems from being insistent and regular: there are too many view corridors and changes of function to be systematic. It’s a museum with so many exceptions to the rules that the rules don’t dominate. Boredom never sets in. Curators cultivate their own version of environmental diversity within the galleries. Rather than treating all works “equally” in white-box environments, the curators have ganged some collections thematically while allowing other works to float in spaces of their own. Some walls are colored and patterned graphically, and some are left white, depending on the art displayed. Lifting the galleries and auditorium above the lobby created an opportunity for grabbing long views from higher elevations. Piano kept the long street wall of each gallery along Gansevoort opaque, for hanging art, but opened the narrow east and west ends. On the west, plate-glass windows just off the elevators refresh museum eyes with distant views over the Hudson to New Jersey. Even the back wall of the auditorium on the third floor is glazed floor-to-ceiling, wall-to-wall, so that when the curtains part, a speech takes place against the vista. In the opposite direction, east toward the city, the glass facades open onto wide terraces that cascade down the building, providing space for sculpture gardens, café seating, performances, and outdoor installations. Expanses of blank outdoor walls are being used for projections and art installations, again extroverting the museum, providing very large outdoor venues for programs yet to be invented. From here, visitors can walk down the steel gangplanks to the floors below, continuing their visit. Their promenade brings them past outdoor sculpture and installations. Visitors are not captive of the galleries but can dip in and out of the museum, free to meander. 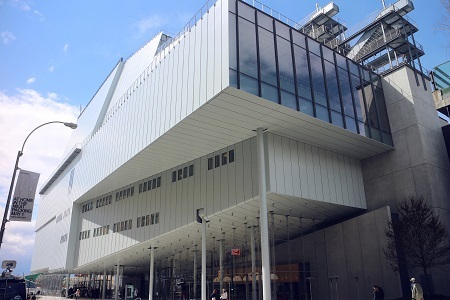 If the Whitney in its openness to the city is nearly unique among museums and buildings in New York, it is also unique in Piano’s oeuvre in the US. 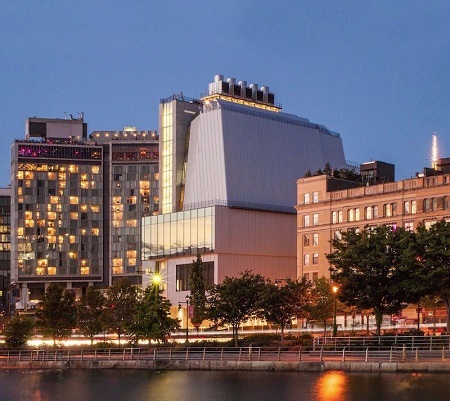 Arguably Piano has been the go-to default architect for museums in America, the Whitney being the 13th, following on the heels of his renovation and expansion of the Fogg Museum at Harvard, which recently reopened. Though the Centre Pompidou was the big bang of his career, ironically Piano established his reputation in America as an architect of museums in suburbs. The Menil Collection in Houston was his first, in 1987, an understated mostly one-story building in a park-like setting ringed by streets of wood-frame houses. On this flat site in a residential community, there were no contextual challenges other than the need to keep the scale of the building modest: the unobstructed site offered few impediments and demanded no ambitious architectural gymnastics or urbanistic responses. Piano left it simple. Piano’s achievement was to reinvent the traditional saw-toothed skylights of industrial sheds as delicate louvers, which captured and reflected Texas’s harsh light, creating a lyrical, glowing ceiling inside. Shaped like f-holes on a violin, the louvers were suspended by a steel space frame that was largely hidden. The High Tech language from Paris was tucked out of sight. It instantly became everyone’s favorite contemporary museum, and the basis of his reputation in the US as a museum designer. He followed this museum in 1992 with the Cy Twombly Pavilion, a monographic museum also on the Menil campus. Again within a simple one-story structure, he created sublime natural light: an external canopy of louvers shades a sloping hipped-glass roof under which a ceiling scrim diffuses light with perfect evenness. He softened light into an atmospheric cushion in which even the most sensitive passages in Twombly’s fragile paintings thrive. But his strength was also his weakness. The Centre Pompidou was a High Tech systems building, conceived as a kit of parts industrially produced and assembled, enclosing universal, column-free space. When he came to America and worked at a much smaller scale for museums with boutique collections, the High Tech style receded, his predisposition for systems expressing itself mainly in skylights and roof trays that filtered light. Unlike his partner on the Pompidou, Richard Rogers, who consistently applied and monumentalized the High Tech style, Piano said that an architect should not have “a preconceived image of an apple in mind when designing an apple, but should discover the apple through design.” Nor did Piano cultivate the competing impulse to become a form-giver who shapes sculptural architecture best suited for a postcard. That he seems to have no stylistic signature, at least in his museums, may be the reason that he, unlike Frank Gehry, for example, has been called for so many museum commissions: no one is afraid that he’s going to repeat himself on their museum. In addition, museum boards playing it safe favor mild-mannered understatement. Piano delivers refined architectural elegance rather than challenging statements: he remains an old-guard Modernist without pretensions to the avant-garde and so stays inside a certain zone of known aesthetic comfort. He’s not a formal adventurist. He’s not going to freak out any trustees. The weakness inherent in this strength was that he remained a one-story architect, best when dealing with a one-story museum that allowed celestial light into all the galleries. Piano tended to turn even multistory museums into one-story buildings by putting all his eggs on the floor with the skylight. 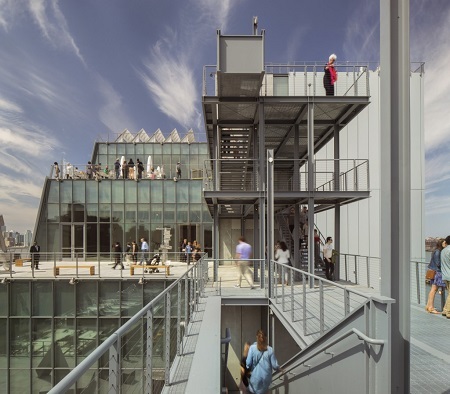 In his 2005 expansion of the High Museum of Art in Atlanta, where he added onto a brilliant structure by Richard Meier, only the top floor of the two additions benefited from the natural light: he was unable to bring it down to lower floors with light chimneys or interior atria. Its facade of modular aluminum panels recalled his instincts as a systems architect, but they were just that, systematic, without life, and certainly without any spatial play. Meier’s unsystematic structure, a highly porous architectural forest of white columns and beams, was not upstaged, Piano’s additions remaining practical, offering more display area. The Menil Collection of 1987 was still the touchstone of his American career: every museum board wanted one as good, even though his subsequent efforts were surprisingly uneven. In 2006, for the expansion of the Morgan Library & Museum in New York, Piano resorted again to systems. The architect had to integrate several existing turn-of-the-century buildings (two of them neoclassical) located on two parallel streets with a backyard addition that bound them together. Piano responded with a bland facade of prefabricated panels that hyphenated the older buildings on the new entrance along Madison Avenue. The gray steel panels were flat, cold, even anemic, with none of the grace of the older buildings, and none of the animating chiaroscuro cast by their stone details. Natural light again washed gently through skylights, but he didn’t cultivate effects of light on the facades. They had no dimensional depth. Piano’s main achievement at the Morgan was inside, where he created a cavernous, glass-enclosed piazza: he brought Italy’s piazzas off the street, to urbanize the interiors and bind the village of surrounding buildings into an urban whole. At the Los Angeles County Museum of Art, Piano incorporated the best of his museum ideas into a cluster of structures that largely accounts for the reason the museum has become a social nexus in a city with few active public spaces. His boxy three-story Broad Contemporary Art Museum was notable mostly for the beautiful light filtering through the skylights on the top floor, and for a playful scaffold outside of red steel supporting stairs, escalators, and landings, which recalled the Centre Pompidou’s exoskeleton. 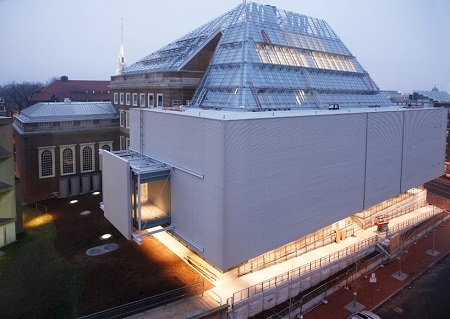 In 2011, he followed the Broad with the 45,000-square-foot, one-story Resnick Pavilion and extrapolated visual motifs from the Broad, extending the exoskeleton with outdoor steel corridors, and adapting its angular steel skylights with an amped-up row of saw-toothed skylights, marching along the roof of the Resnick pavilion. The profile of the Resnick skylights, far more muscular than that of the more delicately scaled Menil Collection, has the ordering presence of a row of Greek columns. The skylights decisively structure the outdoor space, giving it visual measure and rhythm. Most importantly, the Broad and Resnick formed one side of a piazza opposite the back of the Ahmanson Building, the main LACMA structure. Piano extended the covered steel corridors across the space with a wide roofed area adjacent to a new restaurant and café, creating again a piazza but with breathtakingly minimal means — just a thin, flat plane cantilevering beyond its red steel columns. As in the Morgan Library, he brought Italian urbanism to an American venue. Angelenos have responded in droves, enjoying the protected outdoor space before and after visiting exhibits. Piano has mastered the fine art of attracting people to public spaces: he knows how to plant to attract the birds. Still, the commission at LA’s County Museum was not fully urban: it was a large site adjacent to a park, and it did not engage his urban instincts. The two structures solved the problem but without much architectural ambition: they were just boxes with an interesting roof. Similarly, the glassy modern wing he added to the Art Institute of Chicago in 2009, adjacent to Millennium Park, was neither suburban nor entirely urban: there was no urban compression, none of the environmental constraints that tighten and inspire his better projects. His response in the Institute’s Modern Wing was to design a three-story glass garden pavilion. 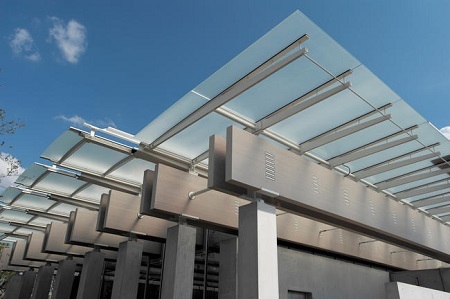 He floated a heroic glass roof plane over the structure, designed to filter light to the top floor. But by now the elaboration of the roof had acquired the status of automatic rhetoric, a figure of Piano’s speech looking for a place in a simple architectural sentence. The functional impulse to bathe galleries in gentle, even light, starting with the Menil, became formalist, but even as form it remained only planimetric — flat rather than spatial. 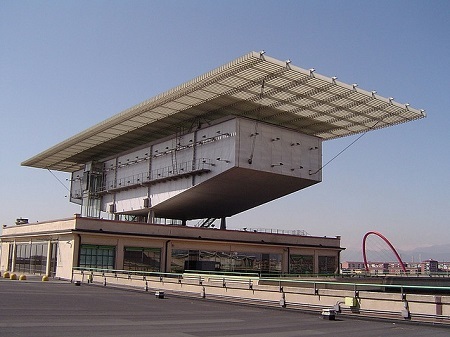 The idea of a floating roof — which he had developed rather spectacularly in Turin, Italy, for a jewel-box museum atop the Lingotto factory in 2003 — reappears again a decade later in Texas. At the Kimbell Museum in Fort Worth, he had the highly sensitive, potentially Oedipal commission to add onto perhaps the most revered museum structure in America, by Louis Kahn (for whom Piano had worked). A one-story building in flat Texas territory, the Kimbell presented a basically suburban context similar to the Menil, and again Piano made use of a floating roof that planes over his addition. He was the perfect match for Kahn because the American master was also a poet of light, having created inside the Kimbell vaulted roofs that feather light on its buoyant curves. Still, by this time, a free-floating roof plane was a known quantity for Piano, almost a cliché and perhaps a crutch: certainly he was not pushing himself into new territory, just refining a standing idea as he applied it again. But at the recently completed expansion of Harvard’s Fogg Museum, now absorbed within the consolidated Harvard Art Museums, something interesting happened to the plane of glass floating serenely over the structure. For Piano, a glass roof filtering a museum’s light is a given, as fundamental as the ground: he builds down from the sky. But at the Harvard Art Museums, he bends the glass plane into a hipped roof that straddles the old Fogg on Quincy Street and his new extension along Prescott in back. The lantern, which houses classrooms and art conservatories, is the equivalent of a mansard roof that works to yoke the stately, neo-Georgian Fogg to the new kid on the block, Piano’s bold addition. Piano based his extension in a De Stijl language, in intentional contradistinction to its neighbors. What has bent the flat roof here into a three-dimensional shape is the necessity of invention spurred by the complex demands of multiple contexts. As in New York, he finds himself challenged by a dense urban setting that exerts strong pulls on the design. He cannot get away with a simple, flat one-story building, or even a three-story building with a flat floating roof on top, because the new and old buildings are of different heights, with different uses. Adapting each half of the lantern to its respective building causes a change of slope and a break in the form. Georgian on the outside but Italian Renaissance in its inner courtyard, the Fogg also stands next to the Carpenter Center, Le Corbusier’s only American work, a curving structure built in raw concrete. Piano’s statement had to be able to stand up to its distinguished Georgian, Renaissance, and Modernist contexts. Piano married it all under his bent roof. The New York firm Gwathmey Siegel, whose existing Fogg addition was torn down for this expansion, had already done an apologetic addition that cowered in the presence of the Carpenter Center. Piano instead engaged Le Corbusier with a massive floating volume of galleries whose narrow end is punched out with a projected plane, extending the museum toward the Carpenter Center. While some would say this crowds the Carpenter, the gesture compresses the outdoor space between the two to form a grassy courtyard. Piano has defined a real place out of what had been a no-man’s-land. Piano also extended the ramp that Le Corbusier designed to sail through the upper floors of the Center. A pedestrian street, the ramp had been unceremoniously truncated, landing inconclusively in a mound of lawn. Piano corrected the unfortunate architectural amputation by continuing the ramp beneath the cantilevered volume of his main structure, which floats above. In this tight urban site, bounded by architectural monuments, Piano invented a puzzle of a building with bold, ingeniously fitted masses. The architectural composite of old and new, at once respectful and forceful, confirms that when Piano confronts dense urban sites, his talents rise to the occasion in complex, integrated responses: left to their own devices, without the urban bur, the museums remain mono-dimensional. At Harvard, the glass roof, glowing at night, manages to unify the front and back, the Georgian and the Modern, into an unexpected and intriguingly improbable whole. Inside, the Fogg’s two-story atrium — its arched walls sheathed in travertine — is now the podium for the lantern, a vertiginous glass extension that takes over the space with a fun house of reflections and transparencies, all supported by a bewildering structure of steel beams and mullions. The excess of engineered rationality looks irrational, beyond perceptual grasp. Inside and out, the lantern is transformative in the best sense. Along with the Harvard Art Museums, the Whitney represents an unusual next step in Piano’s opus of American museums: a site with urban demands and opportunities prompted him to juggle many issues simultaneously, all leading to a more spatial reaction. Classic Modernist simplicity ceded to a newfound complexity. The planimetric architect who seemed always to give his buildings over to the roof became more three-dimensional, distributing the interest in the building throughout its body. 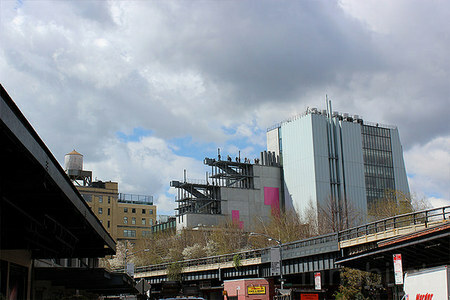 The Chelsea site, at the edge of the meat market, facing a highway and the Hudson, at the end of the High Line, at an intersection of urban desire lines, represents the most urban context that Piano has faced in America, and it brought out a very rich and complex response, arguably his best ground-up museum in the US. He created a small vertical city within the larger city, nesting one within the other, intensifying both. In the Meatpacking District, he was in his element. Not that he was dealing with palazzi: he understands urbanism for its layers and for its flows, for its activating and animating infrastructures, and not for iconic and elitist structures. But responding to the facts on the ground and the museum requirements, what Piano calls “the force of necessity,” does not tell the full story. This was not just architectural realism, the design not simply a resultant, not simply the sum total of the urban givens. Yes, he embraced the urban facts to ground the project and avoid arbitrary artistic gestures. But Piano mixed responses with what he calls “desire” to achieve a whole more compelling than the sum of the metropolitan facts. The building is not a Modernist essay about how lines of weight gather in a building and lead to the ground. His building turns with the sight lines and rises with the mass. It moves. Enclosed by a cliff of inclined walls, the three-story volume sitting above the large, protruding fourth-floor gallery is paneled in steel painted an atmospheric light blue that in certain lights dissolves the mass, making it appear translucent. The architect who started his career as a young Turk professing High Tech has transformed in Chelsea into a seasoned architect who pairs function with poetic motivation, to foster what he calls “dreaming, loitering, watching the sunset, meandering.” His largo, terraces and staircases, inside and out, spatialize the visit, so that the museum is no longer a series of walled boxes or simple warehouses of blah space, but a changing experience that refreshes the eye with changing vistas in a multi-perspectival environment. The Greeks believed that walking promotes thinking: this building is, in their sense, peripatetic. The Breuer Whitney and the Piano Whitney could not differ more. Somehow the same institution inspired buildings that project a diametrically opposed ethos. When all is said and done, the Breuer building, for all its so-called Brutalism, was (and remains) magical: visitors step into an aura created by tonal materials — slate, granite, and raw, textured concrete — that established a shadowy, evocative ambiance, a nearly religious environment that encouraged contemplation and concentration. It triggered feelings. It was an icon (and will continue to be: the Whitney has leased it for the immediate future to the Metropolitan Museum of Art as a venue for modern and contemporary art). Piano’s Whitney, however, is not magical, and doesn’t strive to be. Its temperament is lighter, more upbeat; tapping the flows of the surrounding city, it has a quicker pulse and lifts the onus of Kultur from the visit. With cooler materials, including steel and glass, and a more extroverted body language, it triggers activity more than feeling. On their way to and from galleries, in and out of the building, visitors climb over and through it, landing on terraces that reveal the city as an artifact as rich as the paintings of similar views inside: Piano turns the sock inside out, offering the cityscape as a virtual panoramic tableau. The participatory environment involves the viewer not just in the art but in a larger experience. People act on the building; they own the space. Artists too are invited to reinvent their art on the exterior walls, as though on billboards legible from the High Line and surrounding buildings. Piano designed an un-icon. Piano created a building so complex that its image is fragmented and plural, changing from all sides. It’s not an ethereal and refined building meant for connoisseurship. It’s not even an exhibitionistic piece of architectural engineering like the Pompidou. Equally refined and rough, it represents both an inventive and intellectually ambitious paradigm shift, and an unpretentious, approachable people’s building: a working structure, like the old neighborhood around it, it behaves like a trampoline inviting users to jump all over it. It’s an extension of the High Line, just with a lot of well-displayed art inside. The chief curator of the opening show, Donna De Salvo, spoke about “the inconvenient complexity of American art” and the “impossibility of offering a tidy picture of this country, its culture, and, by extension, its art.” The individuality of America’s artistic traditions escapes easy categorization. The collection could be a metaphor for the building: it does not come in a tidy package. However, in Piano’s hands, the complexity enriches the experience in the way complex cities do. Like the towns in Italy or the Meatpacking District itself, it is humanistic: juices run through it.